A special Eucharistic celebration and a ceremony of New Leadership took place on Saturday 1 July 2017, to formalise a new arrangement between the Congregations of Our Lady’s Nurses of the Poor and the Sisters of Charity of Australia. The community was grateful to have Bishop Anthony Randazzo as the Presider. Sisters from both congregations gathered in the Chapel of the Convent of Our Lady’s Nurses of the Poor to witness this historic event. A votive Mass of the Blessed Virgin Mary with appropriate readings and hymns was chosen. The Gospel reading was the Visitation and in his homily, Bishop Tony highlighted Mary’s actions and invited us to imitate her. Mary’s focus, he said, was on others and despite the hardships she endured to visit Elizabeth, she radiated joy. While there has been struggle and pain in coming to the important decision for this new beginning, it is a time of hope and joy for both congregations now. Bishop Tony then addressed Sr Clare: “Clare, you and your Council have agreed to the request by Our Lady’s Nurses of the Poor to become their Congregational Leader responsible for governance, administration and pastoral care. 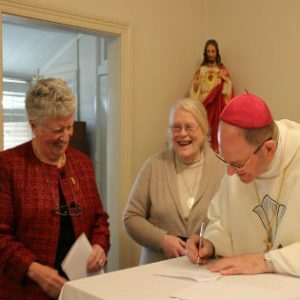 Do you confirm this decision and its formalisation today?” Clare said: “We do.” Bishop Tony prayed: “May God bless this new relationship abundantly and bring about great graces for all concerned, for the glory of God and the good of the whole Church.” Both sisters signed the official agreements. As Sr Clare concluded her thanks, Sr Margaret Mary came forward and presented her with a magnificent arrangement of flowers. 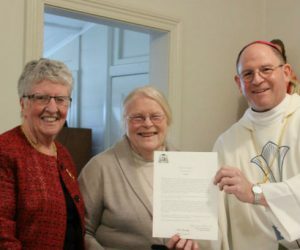 Sr Margaret Mary too, expressed her thanks to Sr Clare, Bishop Tony and all who had assisted in helping them reach this undertaking. She said that the precious seed had been planted and will now be nurtured with hope and trust. 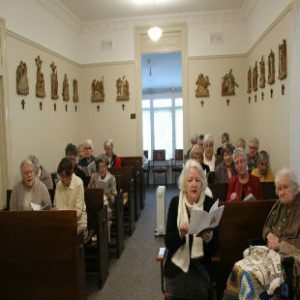 Main image: Sr Margaret Mary Bigan oln, Bishop Tony Randazzo, Sr Clare Nolan rsc, Congregational Leader of the Sisters of Charity of Australia and Our Lady’s Nurses of the Poor.